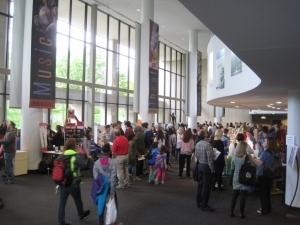 SEAS 2019 is Tuesday, April 23, 10am-2pm @ GMU Center for the Arts! We are pleased to announce that transportation funding is available for schools needing this support to attend SEAS. Reimbursement for bus transportation up to $500 per school, until our funding runs out. Email showcase@novaoutside.org if interested. 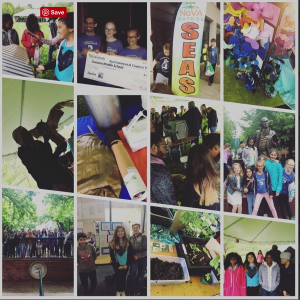 NoVA Outside’s Student Environmental Action Showcase (SEAS) is a regional event welcoming students from Alexandria City, Arlington County, Fairfax City/County, Falls Church City, Loudoun County, and Prince William County schools. See the NoVA Outside May 2018 newsletter for a recap of SEAS 2018. Photos from the event can be seen in this blog post and on Twitter #NOVASEAS18. 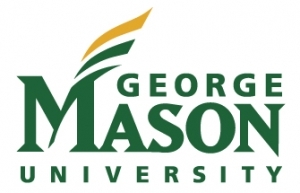 The event is held in partnership with George Mason University’s Potomac Environmental Research and Education Center (PEREC) and with Earth Force, which annually hosts the Virginia Caring for Our Watersheds competition as part of the event. We a lso partner with the Thinkabit Lab at Virginia Tech, affording students an opportunity to tackle environmental problems using programming and sensors. Each year SEAS also features an eco-art event. In past years these have included a recycled-material mascot contest, a Video Visions exhibition, and a music festival with performances on instruments built from recycled materials. In 2019 the eco-art event is focused on news media, journalism, and reporting. SEAS allows students, teachers and administrators to network, build knowledge and gain ideas to further their school’s efforts in environmental stewardship. In addition, two dozen partner organizations such as federal, state and local agencies and NGOs provide hands-on green STEAM learning activities for the students and talk to kids about their careers. Elected officials, senior school personnel, corporations, state education officials, and others are invited to the event to share with the students and to become more aware of the strength of student environmental action in Northern Virginia and the importance of supporting such work. Volunteers and Sponsors for the event are appreciated. Please contact showcase@novaoutside.org if interested. Eco-Partners can sign up to lead an activity for student groups at the partner village (outdoor tent area). Eco-Partner Registration is now open. • General Showcase (grades K-12) – Put together a small table top presentation and tell us what you are up to. Just getting started? Well on your way? That’s ok! Come and share ideas. • Eco Art – In 2019 we are excited to host an Eco Art Photo Contest for younger students (grades K-6) and to partner with Young Reporters for the Environment (ages 11-25, note February 22 deadline). Join other reporters from across the globe to highlight environmental issues. Enter this contest and we will display your entry at SEAS. • Caring for Our Watersheds (grades 6-10) – Earth Force hosts this competition that asks students what they can do to improve their watershed. All teams are invited to the Showcase. The top 10 regional teams will present their proposals. • Our Power (grades 6-12) – students meet in a small group setting with decision-makers and leaders to learn how they can be more effective in their projects and advocacy. Meet in a small group setting with elected officials or advocacy experts to strategize taking your project to the policy making level. Small teams will be matched with experts based on descriptions of your environment/civics project. • Envirothon and High School Track – network with others and see how you are all improving our environment. See the Envirothon finalist presentations as they prepare for the regional competition. Interact with college students in environment related majors. SEAS 2019 REGISTRATION IS OPEN: register your student/school group here.